How do you know which Fidelity funds to buy? If you're like most people, you have better ways to spend your time than rifling through SEC filings, prospectuses, statements of additional information, quarterly fund filings and interviewing Fidelity's fund managers. We do have the time and the expertise to thoroughly analyze Fidelity's 200+ funds and help our readers make bigger profits, with more consistency, and with greater safety than ever before... GUARANTEED! View a sample Fidelity Monitor & Insight report. 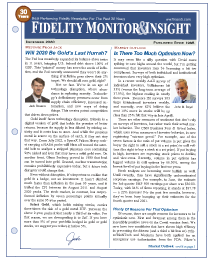 Sign up today -- GET 3 MONTHS FREE -- and begin receiving monthly Fidelity Monitor & Insight reports right away!